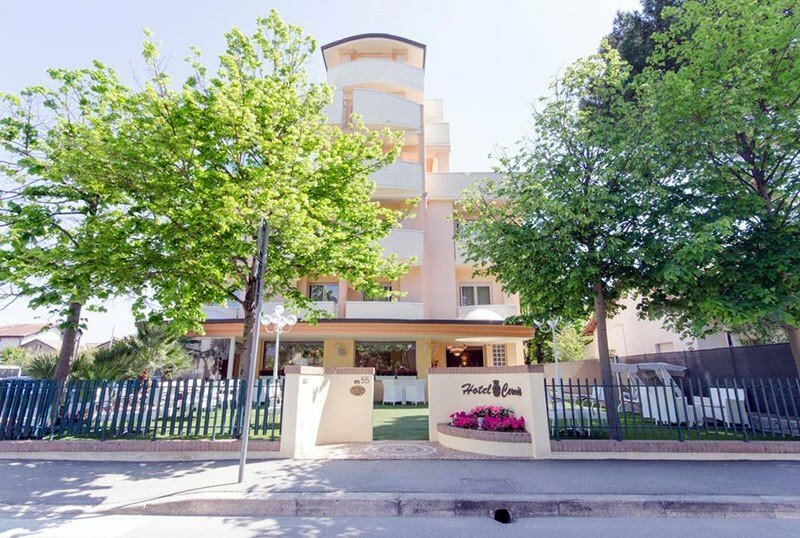 Hotel Cervia is a 3-star hotel located a few steps from the sea, in a quiet area with little traffic. Ideal for families with children, it offers parking, miniclub, swimming pool and free WI-FI throughout the structure. Small pets are allowed. The property is located a few steps from the beach, in the first parallel of the promenade in a quiet area with little traffic, just 5 minutes drive from the city center, where are the clubs, museums and other attractions of Cervia. The location of the hotel is also convenient for reaching the beach in less than 2 minutes on foot. All rooms have a balcony - sea view or garden view - and have independent air conditioning, heating, free WI-FI, 32 '' satellite TV and digital terrestrial, direct telephone and bathroom with hairdryer and shower. Minifridge on request. FAMILIES : Communicating solutions and family rooms for large groups are available. DEPENDANCE : those who want an independent holiday home, while enjoying all the services provided in the hotel, can stay in the annex, a villa located a few steps from the main building and equipped with double or twin rooms with private bathrooms and private parking, as well as services of the rooms listed above. In addition it is possible to add a cot with fall protection for children. Garden, open-air porch, terrace, swimming pool, beach towel, jacuzzi and bar open 24 hours a day. The staff organizes theme nights and water aerobics classes. BREAKFAST : international buffet, with homemade desserts, pies, cakes, fresh bread, cereals, jams, plum-cakes, fruit juices and, for lovers of salty, meats and cheeses. LUNCH AND DINNER : 3 choice menu based on local cuisine and international recipes with meat and fish every day, vegetable buffet, salads, appetizers and homemade desserts. VARIATIONS : the menu is suitable for vegetarians and the staff prepares gluten-free foods for coeliacs. OTHER: weekly evenings are organized theme nights with typical dinners, gala and parties. In the hotel : children's pool, indoor playground area with baby / mini club and live entertainment (workshops from 10am to 9.30pm) and strollers available. Baby-sitter and pediatrician services at an extra price. In the room : cribs, camping beds, the fall protection, baby bath, changing table, night pot and reducers for toilet and night light. At meals : flexible hours, menus tailored to children, vegetable soups, vegetable and meat broths, pasta with tomato or white, fruit smoothies, meat, steamed fish, cheese. On the beach : playgrounds and entertainment. The swimming pool is located on the third floor and enjoys a panoramic view, is equipped with hydromassage, possibility of swimming against the current and is suitable for children, with a depth of 110 cm. Those who wish can also participate in the lessons of Aquagym. The hotel has an agreement with the Bagno 75 with games for children, nursery, baby sitting, table tennis, hot showers and many other services for adults and children.